Since the last report more sightings of giant Death’s-head Hawkmoth caterpillars have been received. In south east Cornwall Wendy Zealey recorded the one shown above left on the edge of woodland and Susan Knowles found the beauty shown above right in a lane near Yeovil in Somerset. Interestingly all reports received from the UK this year have so far been of the yellow form. Thanks to Wendy and Susan for their sightings and use of their photos. In recent weeks good numbers of another migrant Hawkmoth, the Convolvulus Hawkmoth, have been arriving in the UK from Europe. Here in Cornwall as well as being attracted to the garden light trap the moths have also been attracted to the flowers of Nicotiana plants, more commonly known as tobacco plants. Their arrival may offer one of the best opportunities for several years to find their caterpillars in the coming weeks. The caterpillars feed on plants in the convolulaceae family which includes bindweeds commonly found in many gardens, hedges and fields. I’ll certainly be showing a keener interest than normal when tearing out bindweed from the garden. 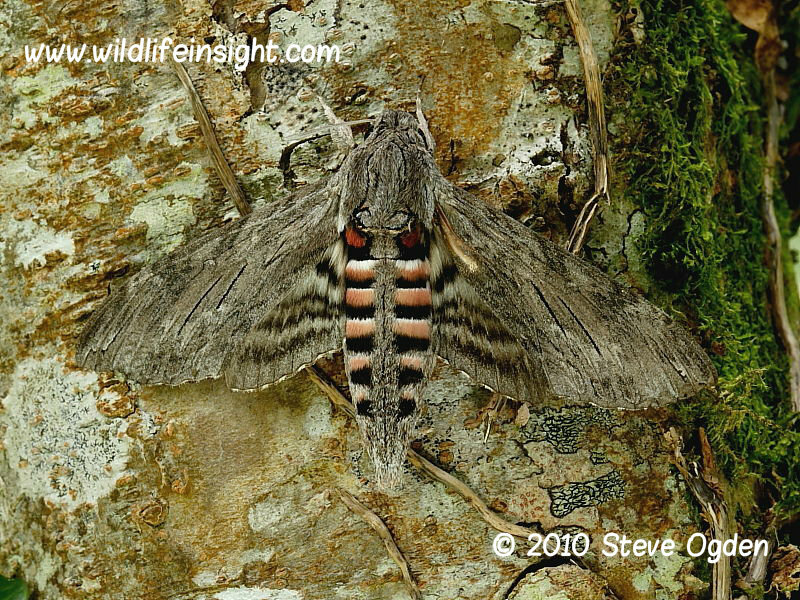 The photo shown above is of a Convolvulus Hawkmoth attracted to light in north Cornwall in 2010. Thanks to everyone who have sent in photos from so many countries around the world. Many will appear in future galleries and species pages with accreditation.